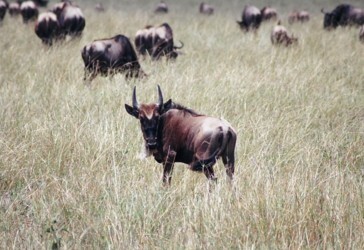 Common wildebeest, Connochaetes taurinus, C.t. mearnsi, Western white-bearded race and C.t. albojubatus, Eastern white-bearded race. Each year around the same time the 'Great Wildebeest Migration' begins in the Ngorongoro area of the southern Serengeti of Tanzania. A natural phenomenon determined by the availability of grazing. It is January to March when the calving season begins. A time when there is plenty of rain ripened grass available for the 500,000 zebra that precede 1.8 million wildebeest and the following 100,000 plains game. The calving grounds of the eastern Serengeti happen to be outside the hunting territories of most of the predators, such as hyena, cheetah, hunting dogs and lions although some losses to these predators can occur. Wildebeest cows do not seek isolation during calving or afterwards. In migratory populations the cows will congregate in there hundreds on the calving grounds. Wildebeest society is much more structured at this time. Groupings of pregnant cows, cows that have calved, groups of yearlings recently separated from their mothers and bachelor herds, which are usually excluded by the territorial bulls from the calving grounds. Expectant cows gather and drop their calves before midday (very few are born after midday). Labor will last 30 minutes to one hour and may be interrupted at any time, should the cow be disturbed. When the calves head and trunk emerge, gravity will complete the process as long as the cow is standing. Giving birth usually occurs whilst the cow is lying on her side and can have visible contractions. Once the calf is born the mother will lick her new-born and within around 10 minutes the calf will be on it's feet, seeking it's mothers udder. The mother may move away at this point which will encourage the calf to follow closely. Mothers and calves then group into nursery herds. Mix-ups and lost young can be a problem at first in large groups, as the instinct to follow means the calf will approach anything that moves, including predators. It is the responsibility of the mother to stay with her calf for the first day or two, for the calf to be imprinted on her. The imprint process starts with the first successful suckling. Initially each mother will recognize her own calf by scent and will actively reject all others. This means, the calves that become separated from their mothers, are doomed to starvation or predation. 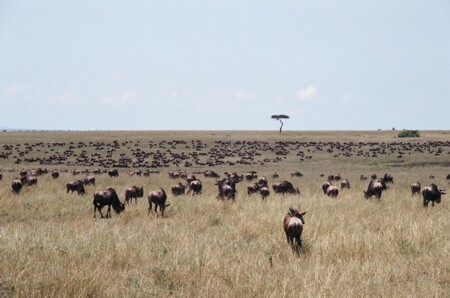 March, April and May is when the herds begin to sweep west and north towards the long grass plains and woodlands of the Serengeti's western corridor. Here the herd divides when some swing further west than others who head northwest. They will meet up again in the Masai Mara of Kenya. The long rains have started and the southern grass plains they leave behind are depleted of all food, so the herds must press on. By the end of May the rains peter out and the rutting season begins. A time when males are in their prime condition. Wildebeest bulls become territorial at 4/5 years (Estes 1969), when during the rut they will undergo dramatic behavioral changes, becoming the noisiest (C.t. mearnsi) and most active of all African antelopes. Territories, mostly small can be fought, won and lost but usually only held for a matter of hours while the migrating herd is passing. Territories of sedentary populations are much larger and usually are held for longer. The rut will occur when the animals are in prime condition so as to ensure an adult conception rate of more than 95%. If female yearlings are well nourished, first conception may occur at 16 months, but more usually they only conceive one year later. The gestation period being from 8 to 8.5 months. Competition to gather and hold as many females as possible is great; on average one bull will hold in the region of 16 females as long as they are within his territory. During this peak of male activity the bulls will neither eat nor rest as they indulge in constant fights with neighboring males. June to July is a transitional period between the rains and the dry season. As they concentrate on the few remaining green patches of savannah, these huge herds reform and push further north towards the Masai Mara. This final push north results in a massing along the banks of the swollen Mara River, producing one of the world's truly most spectacular sights. After four long months trekking, these animals are in desperate need of water to drink and grass to graze. Many of the young find it exceptionally difficult to come this far, sometimes going for days without water. Many die from exhaustion and thirst before they reach the Mara River, but also many survive, just, only to find one last huge obstacle in their way. 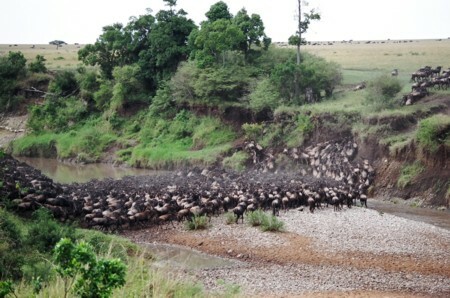 Depending on the recent rainfall sometimes the chosen crossing place is shallow, which allows the majority of the herds to cross safely. But often the river is deep and fast flowing, with steep banks either side. Many of the weaker animals are not able to cope with the strong river currents or the buffeting from other wildebeest as they swim. Hundreds of animals can die during the crossing, littering the waters edge with corpses. These will be dispatched by the numerous, hungry, and eagerly waiting crocodiles. These Nile crocodiles are some of the largest in Africa, measuring up to 15 feet in length. Lion and hyena will also take the bodies from the waters edge if they can pull them out on to land. When so many animals are massed at rivers and waterholes, stampedes are common, causing cows and calves to inevitably become separated. It is possible for a calf to cross and re-cross the river 2/3 times during the frantic search for its mother. This is when the vulnerable animals can be taken by crocodiles as they panic and become exhausted. Luckily for the calves, most separations are only temporary and when they are re-united the calf will immediately dive for the udder. Between July and October the wildebeest reside in the Masai Mara, grazing the lush green grasses that the earlier rains encouraged. 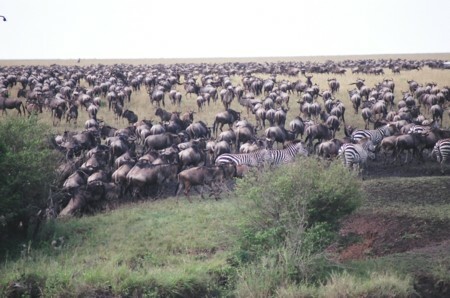 The mass of over 2 million animals cover the savannah and grasslands as far as the eye can see. Predation by leopard, lion and hyena at this time is great simply due to numbers. There are just so many prey animals around that the predators have to taken advantage to feed their own young, a time of plenty for all. October to November is when the short rains begin to fall in the south and east Serengeti, so the herds start to leave the Masai Mara, crossing the Mara River yet again, bringing all the same perils as before. They head slowly back to the Serengeti's eastern plains. By the time they arrive it will be February and the cycle is complete. Arrival at the calving grounds marks the end of this, and the start of the next year’s migration. In all 250,000 wildebeest die during this 1,800-mile journey, the sick, the lame, old and very young, but the next calving will produce around 500,000 new calves who must take their chances along with the adults on the following 'Great Migration'. (Being a natural event the timings of this migration may vary from year to year). The entirety of the migration is dependant upon the coming of the rains. In Africa's hot and dry climate, such huge numbers of animal life cannot be sustained by one place. They have such a dramatic effect on the grazing pastures, taking no time at all to completely exhaust the available food supply. As the rains come at different times in the Serengeti and the Masai Mara, so the animals are driven to search for the rain-ripened grasses and water to drink. Wildebeest need to drink every day or at least every other day. So, this clockwise constant search for favorable conditions pushes the herds onwards, month by month in order to feed themselves and their young. 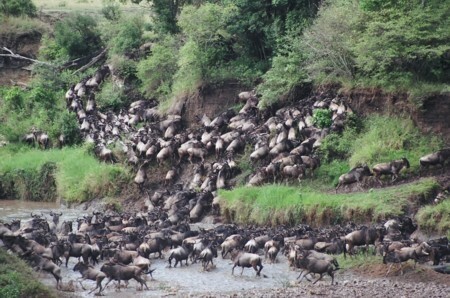 There are a few sedentary populations of wildebeest, but most are migratory. Even the process of birthing has evolved to become unlike any other land mammals. Wildebeest are the only land animal to synchronize birthing to within a 2/3-week period. At a time and place, when there is plenty of grass and water to drink. Open plains away from the majority of predators. The rains herald the birth of many animals' young in Africa; such is their dependence on water. If the majority of young are born around the same time and are able within a few minutes to keep up with their mothers and the constantly moving herds, they are more likely to avoid predation. The larger the herd, the smaller is any individual members probability of being targeted for attack by a predator. This is known as the "dilution effect".